Maraaya, the married duo that represented Slovenia in the Eurovision Song Contest 2015 with ‘Here For You’, have released a new single! The title of the song is ‘Diamond Duck’ and it’s Raay’s 341st song. Lots of songs he has written there but what’s special about this one is that it’s the first one that will be released worldwide as Maraaya are the first Slovenian artists ever to sign with Warner Music! The song itself is about it being important not to get attached to earthly possessions and money but to put love at the forefront: ”We don’t need the diamond duck”. 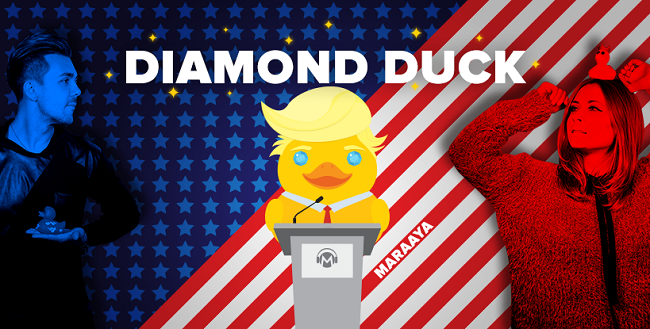 The Diamond Duck itself, you will see, resembles a current world leader quite a lot. Add to that, the final advice, given in a shot after the music video itself: ”Make values great again”. Maraaya sure had a message and an advise for the world, the same one this is their first global release in! What do you think of ‘Diamond Duck’?